The year 2018 is considered to be the year of mobile applications and also the right time to obtain the services of mobile development services. With the arrival of the mobile apps, you might have thought that the popularity of web application frameworks has died down. But you’re completely wrong. You will get a better idea when you contact the web developers. When it comes to web applications we will have to keep in mind the mobile competition and develop a modernized and marketable application for your business. You can approach us because we offer various custom web development services according to your requirements. 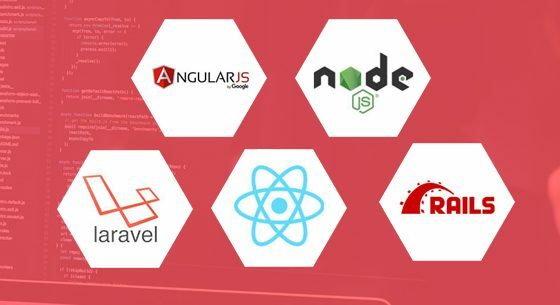 Laravel comes first when it comes to the back-end web development frameworks. It was established in the year 2011 and has shown the bright path to the web developers.It is a free and open source PHP web framework which is intended mainly for building the web applications following the MVC or the Model View Controller architectural pattern. The various features of the Laravel include the modular packaging system with a dependency manager who is dedicated, the utilities that aid in application deployment and maintenance, its orientation towards the syntactic sugar, different ways for accessing relational databases. Hence it is considered to be the best PHP framework and use it for the project. The Ruby on Rails or the RoR is considered to be one of the favorite frameworks for web developers. The developers at work will feel happy when they work with Ruby. Few big brands like Hulu, Airbnb, Basecamp developed their websites with RoR. From the year 2005, RoR has been completely free of cost and runs on Linux, which is also open-source.This framework not only allows you to move from the planning stages to actual development very fast but also when compared to other technologies it is easy to handle. Hence, you can certainly consider RoR or the Ruby on Rails as a useful framework for your next web development project.